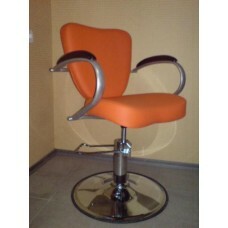 Hairdressing armchair КР014, buy at the price of 246 in Europe. Hairdressing armchair КР014 is widely used in beauty salons and hairdressing rooms. 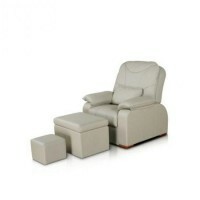 It is designed for comfort of the client during the procedure and has all the necessary characteristics. 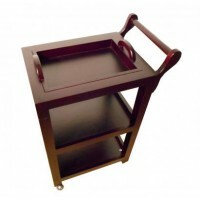 The surface of the chair is made of soft material covered in high-quality leather. It can be disinfected by disinfectant easily. Base of a hairdressing armchair is made of chromed metal and is shaped like a circle. Due to this the armchair is stable and reliable. The chair is suitable even for longer treatments; due to its softness and proportionality, client will not feel discomfort. Convenient armrests are made of wood. Its height is changed with the help of a hydraulic system easily. This greatly diminishes the wizard s work.